The Allan Water is a river in central Scotland. Rising in the Ochil Hills, it runs through Strathallan to Dunblane and Bridge of Allan before joining the River Forth. Two broadside ballads refer to the Allan Water. One is by Matthew "Monk" Lewis (shown above). 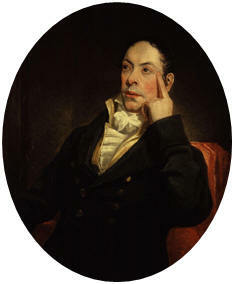 Matthew Gregory Lewis (9 July 1775 – 14 May 1818) was an English novelist and dramatist, often referred to as "Monk" Lewis, because of the success of his classic Gothic novel, The Monk. Intended for a diplomatic career, Matthew Lewis spent most of his vacations abroad to study modern languages, and in 1794 went to the Hague as attaché to the British embassy. Although he only stayed a few months, it was there that he produced, in ten weeks, his romance Ambrosio, or the Monk, which was published in the summer of the following year. It immediately achieved celebrity for Lewis; but some passages in the work were of such a nature that about a year after its appearance, an injunction to restrain its sale was obtained. Lewis published a second edition from which he removed what he assumed were the objectionable passages, but the work retained much of its horrific character. Lord Byron in English Bards and Scotch Reviewers wrote of "Wonder-working Lewis, Monk or Bard, who fain wouldst make Parnassus a churchyard; Even Satan's self with thee might dread to dwell, And in thy skull discern a deeper hell." The Marquis de Sade also praised Lewis in his essay "Reflections on the Novel". Whatever its weaknesses, ethical or aesthetic, may have been, The Monk did not interfere with the reception of Lewis into the best society; he was favorably noticed at court, and almost as soon as he came of age he obtained a seat in the House of Commons as Member of Parliament (MP) for Hindon in Wiltshire. After some years, during which he never addressed the House, he finally withdrew from a parliamentary career. His tastes lay wholly in the direction of literature, and his play The Castle Spectre (1796) enjoyed a long popularity on the stage. The Minister (a translation from Friedrich Schiller's Kabale und Liebe), Rolla (1797, a translation from August von Kotzebue), and numerous other operatic and tragic pieces, appeared in rapid succession. The Bravo of Venice, a romance translated from the German, was published in 1804; after The Monk it is his best known work. The death of his father left him with large fortune, and in 1815 he set off for the West Indies to visit his estates; in the course of this tour, which lasted four months, the Journal of a West Indian Proprietor, published posthumously in 1833, was written. A second visit to Jamaica was undertaken in 1817, in the hope of becoming more familiar with, and able to ameliorate, the condition of the slave population; the fatigues to which he exposed himself in the tropical climate brought on a fever which resulted in his death during the homeward voyage. Lewis held two estates, Cornwall estate in Westmoreland and Hordley estate in St Thomas in the East. According to the slave registers Hordley was co-owned with George Scott and Matthew Henry Scott and their shares were purchased by Lewis in 1817. Lewis visited Percy Bysshe Shelley and Mary Shelley at Geneva, Switzerland in the summer of 1816 and recounted five ghost stories which Shelley recorded in his "Journal at Geneva (including ghost stories) and on return to England, 1816", beginning with the entry for August 18, which was published posthumously. In this tune, the lyrics begin "On the banks of Allan Water" and proceeds to relate the story of the death of a local miller's daughter whose soldier lover proves untrue.